Mantra is Sanskrit for a word or phrase that the yogi repeats during practice or meditation. Its benefits include anything from improved concentration to “feats making the impossible possible,” according to Dr. Gautam Chatterjee, a prolific author who coined the term positive mantra. An empowering and healing word-based mantra starts as a simple exercise of mind. Over time, with steady use, one can imagine their mantra as a precious note brought down from sacred hills, delivering a genuine gift of centeredness to the yogi. Historically, for advanced yogis, the mantra was a gift from their guru. It was a vehicle that assisted the yogi in his or her soul’s drive to oneness with God. Though most of us do not have such a grand purpose for mantra such as union with God, a well-chosen mantra can help us reconnect to a healing place, find a mother lode of peace and contentment, or perhaps even move the impossible to possible. While an active yoga practice does not demand that practitioners choose a mantra, I think it can help improve both one’s practice and one’s acceptance of their place in the world. My mantra has proven its efficacy, even when I resist. I concentrate and silently repeat it with faith that important work is happening. I believe my mantra slowly and steadily lifts me, and in ordinary and arduous moments, I look for assurance from my mantra. I speak, and it answers in Yoda-like fragments, reversing subject and verb, instantly messaging me from the periphery of correctness. “Is this really worth it?” I ask. “Is this really necessary?” I wonder. “Can I put myself through yogic physical and mental stress one more time?” I inquire. “Isn’t there another—easier—way?” I contest. The typical mind, as it goes through daily life, is a mishmash of impressions as it works to sort through memories, sensations, stimulations, discomforts, joys, and the exigencies of negative energy. A mantra, steeled in the mind with practice, actually renews the yogi’s brain and empowers a new reality. By repetition and concentration on positive mantra, the yogi’s concentrated mind cannot help but focus and improve. I hold fast to a tested and proven mantra. It has grounded me, and I see it in the way I apprehend the world and in the way the world apprehends me. I will not reveal it, but my word is not selfish: it is spoken to benefit me and the community. After a graduation speech Muhammad Ali gave at Harvard University, the commencement crowd began chanting, “We want a poem, we want a poem.” Acceding to the crowd’s request, Ali went back to the microphone and said, “Me. We,” and then sat down. Ali’s poem showed his unique ability to understand the word’s power to strengthen both the individual and the community. His was a simple yet profound mantra, one that, degree by slow degree, remakes the yogi and the world. It’s about me yes, but it’s also about us. Trust it is so. 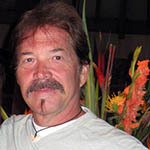 by Gregory Ormson - Greg lives in Hawaii where he does yoga, rides his Harley-Davidson, sells flip-flops and writes. He’s worked as a journalist, business writer, and sports writer. His work has been published in Quarterly West, The Seventh Quarry (Wales), Elephant Journal, The Yoga Blog, Horizons and Entrée.’ You can visit his blog and connect with him on Twitter. Want to contribute as a member of the DoYouYoga community too? Submit your article right here!